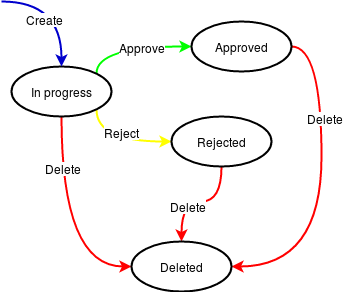 In this post I want to briefly show you one way to encode finite-state machines (FSM) and use them with event sourcing. For the purposes of this post I’ll use Haskell with just basic data types and functions, so translating it in your language of choice should be relatively easy. It’s not very complicated isn’t it? It represents the states of a resource (for example a document) and the possible transitions between them. In other words, the FSM represents a process that the resource goes through. Potentially with multiple users involved. You can think of the states transitions as domain events in an event sourced application. From this point of view, the document state is a projection of domain events that is computed by processing the events sequentially according to rules represented by the FSM. In other words, domain events represents what happened and the document state is derived from them according to a FSM. In this sense, the FSM gives an interpretation of what happened in the domain in the past according to a codified process. A nice property of this interpretation is that this process can change and the document state can be recalculated by replaying the events. Nothing fancy here. It’s just a sum type (you can think of it as an enumeration). Please note that this is a simplistic definition where we assume that we’re working with a single document. Supporting arbitrary resources is not that difficult and I leave it as an exercise to the adventurous readers. A valid transition in which the starting state and the destination one are the same. To differentiate those two cases and obtain a validation of an ordered sequence of events in relation to our process, we make the transitioned state optional too. This way if the required transition is invalid, we’d get a Nothing. Futhermore, now that the input and output states are of the same type we can easily chain multiple transitions sequentially again. Here project takes an ordered list of events and computes the final state by sequentially applying transition to them. You can notice that the starting state is Nothing since we expect a Create event to transition to the InProgress state. Thanks to Currying, I didn’t need to explicitly include the [Event] parameter in the function implementation. A nice property of this implementation is that we get events stream validation for free. If project returns Nothing, it means that the input events are incompatible with out FSM. We can also easily support snapshots with minimal changes! We just need to be able to apply a set of events to an arbitrary initial state, not… just Nothing (pun not intended). Smudge is a state machine and UML diagram generation engine. Smudge is both a language for describing state machines as well as a compiler that interprets and validates those descriptions to generate code and documentation for them. You can find the official tutorial here.